I bought this watch from a major auction house with the intent of reselling it. After wearing it for a week, I’ve concluded that not only is it not for sale, it has replaced my Submariner (#16610) as my everyday watch! This watch to my eyes, is one of the most beautiful classic pieces I have ever worn. My first collectors watch was an IWC cal. 89 manual wind. I have always been attracted to this marque because of their classic styling in virtually all their watches. In addition, I believe that IWC’S attention to detail and overall quality is absolutely first rate. I would put their craftsmanship up against anyone and that includes such lofty heights as Patek, VC and AP. I realize that this is a personal opinion, but I really believe it to be true. The Ingénieur (Engineer, in French-as in electrical or mechanical, not railroad!!) is one of the few watches that is highly antimagnetic, which feat is achieved through the use of a “case within a case”, made of antimagnetic soft iron (whatever the heck THAT means-this is as per the IWC catalog). The dial is gold tone with applied gold baton markers and tritium hands and dots at the end of each marker. The movement on this watch is supposed to be spectacular, I’ve never seen it, but its 33 jewels with a platinum rotor and is a Lecoultre ebauche. That’s good enough for me. Sounds like the same movement in the IWC MKXII, although I don’t know for sure. The bezel is 18k as is the screw down crown. The entire watch is satin finished except for the bezel which is highly polished on the sides. The bracelet is really, to my eyes, a thing of beauty. The tapering is aesthetically perfect. IMHO. The case is actually quite thin, or at least APPEARS that way on the wrist-it’s about 9mm thick. To some , this watch may be too small at 34mm. It looks perfect on my wrist and I’m not tiny at 5’ 11″; 215 lbs. 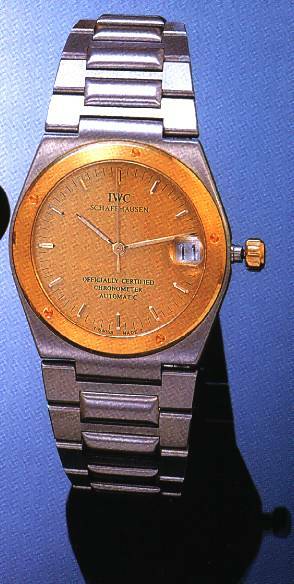 I’ve gone over the entire watch with a loupe, and it is absolutely perfect, the sole exception is a small blemish on the gold bezel, at about 3:30, but after all, I did purchase a used watch at an auction, I’m sure this was not IWC’s fault! The watch is a certified chronometer, and I believe it’s the only one in the IWC line. Mine is about +4 secs/day on the wrist. This isn’t as good as my Sub (1.5 secs/day), but I can learn to live with it! Off the wrist, I’ve only checked it in 2 positions-dial up (about +3secs) and dial down (about +2 secs). The watch is waterproof to 120m (about 400 feet). Again, not as good as the Sub, but in my bathtub, it will be just fine. Setting this watch is a real pleasure, no hand coordination games like with my Sub, simply pull out the crown (hacking the sec hand), point the minute hand where you want, and push the crown back in, its dead on with no slack to worry about. The real joy with this watch is its comfort. It is absolutely the most comfortable bracelet I have ever worn. No pinching and you barely realize it’s on your wrist. IWC has really done a marvelous job here. The clasp closes with an ear shattering “click” and it’s as secure as a bank vault. I did not have to adjust the bracelet at all, it just happened to fit me exactly, but if adjusting were necessary, the links could be easily removed with a jewelers screwdriver. Alas, nothing is perfect, not even this watch! The cyclops lens over the date has a way of producing glare so thats its frequently hard to read the date. The tritum is not terribly bright, strange as the tritium on my Fleiger actually hurts my eyes, its so bright! Last, the bracelet has a fliplock (although no extension link as on the Submariner). The fliplock has some “play” to it which I find somewhat annoying, as I keep thinking it will open- interestingly enough, it has never done so, but it bugs me never the less! If you want an elegant, understated classic, incredibly comfortable sports watch , this is an excellent choice. If however, you want a watch that makes a statement and is one that others will recognize, don’t buy this watch. My guess is 999 out of 1,000 people will have no idea what’s on your wrist!